The Songwriter Showcase | TOMMY LINK INC.
I’m a bit ashamed of myself, considering that I haven’t made any mention to this event (which is rapidly becoming more like a club or society) even as it’s nearly been a year since it began. It’s becoming more involved all the time, and has created an excellent outlet and opportunity for those stand-alone singer songwriters to do what they do best. 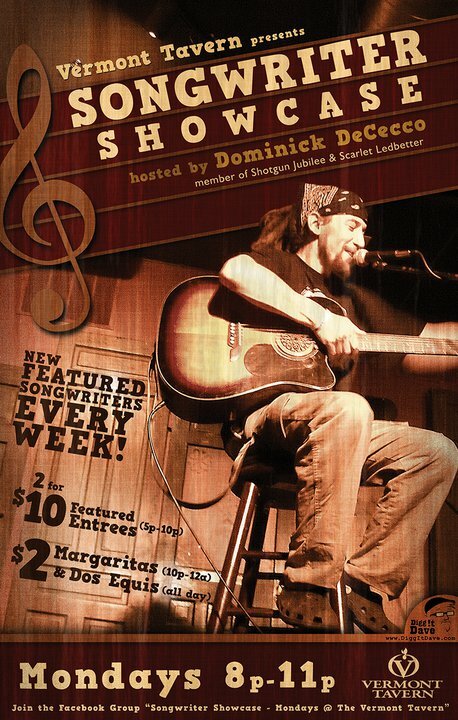 Original poster for the Songwriter Showcase. Since then, The Vermont Tavern has been sold and bought, and the event has moved down the street to a bar called The Crooked i, and is held in it's "Rustbelt Lounge". The Songwriter Showcase was started in the late winter/early spring of 2011 by Dominick DeCecco, who’s earned mention on this website more than once already. Dom being one of the greatest allies and advocates a songwriter could meet, had already began hosting an open mic in downtown Erie PA, but wanted to create something more focused on local original music. Creating a weekday night event, Dom began the weekly show involving 3 local songwriters coming out to play 45 minute sets. All original music. Since its beginning, the SWS has involved some 30 plus songwriters in the group. And more are joining in everyday. I myself have been asked to play several times, being one of the ones fortunate in being part of it from the beginning. Even in the face of adversity (such as the location of the event recently being sold and canceling all music), Dom has hardly skipped a beat and found a new home for the show in less than two weeks. Beyond that, I’m excited to say that I’ve been working closely Dom as of late, and discussion has been made considering expanding the SWS further, to perhaps a second night and a second location. They’ll be more to say about come summer. So, in it’s current state, if you should be in the Erie area and looking for original music on a Tuesday night, head down to the Crooked i at 7:30pm. Everybody’s got a song to sing.